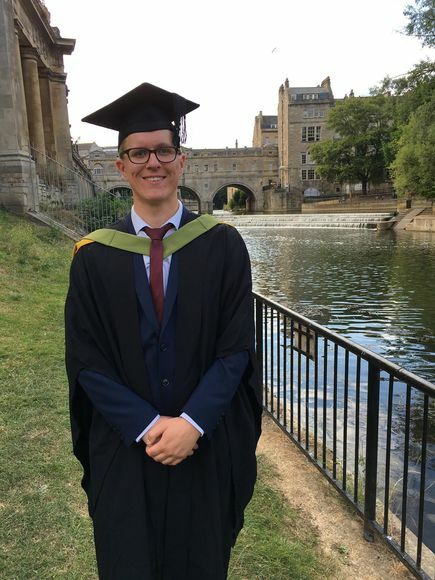 All Saints' Academy Sixth Form alumnus Liam Taylor has been awarded a first class honours degree in Computer Science from the University of Bath. University of Bath was recently ranked 6th in The Guardian's top UK universities. Whilst studying at All Saints' Academy Liam achieved A* in Psychology, an A* in Business and an A in IT. Not only has Liam achieved the top honours at degree level he has also secured a job at a prestigious employer in his field of work. Cisco Systems is a worldwide leader in IT and networking. We caught up with Liam to congratulate him on his fantastic achievement. My biggest achievement was my final year project/dissertation. I carried out research into the design elements of Social Media platforms that make people use them more frequently and whether this could lead to addictive behaviours. It was tough to manage such a large project alongside other coursework and exams but the outcome was a piece of work that I was very proud of and I achieved a first. What did you enjoy most about your course at University of Bath? The course was very challenging which was the best and worst thing about it. The challenge always made the course interesting and when it sometimes got a bit too difficult, having genuinely interesting content made it easier to overcome those challenges. Also, when times were tough on the course people would always come together and help each other out and I have made some fantastic friends as a result. You decided to take a 4 year course that entailed a placement year, can you tell us a bit about it? I worked at Cisco Systems in London for a year in the Mobility department within IT, which is responsible for managing all mobile devices within Cisco. My role included providing analytics around mobile contract spending and security and compiling reports for management to make decisions from. I was also involved in the development and automation of new security processes within the organisation to ensure that Cisco staff and corporate data were protected against any malicious attacks. What advice would you give our Sixth Form students? Make sure you pick a degree course that you are genuinely interested in because the whole experience will be much more rewarding. University is a big step from A Levels and it can seem very daunting at the start but don’t be scared to reach out to the academic staff and peers if you do struggle because you are not the only one. Make the most of your first year and get involved in as many societies and activities as possible because you’ll make so many great friends which will help with the subsequent years when it gets a bit more challenging. Did All Saints’ help you in reaching your goals for university? I think All Saints’ prepared me well for university. All the teachers were very encouraging during my A levels and pushed me to do the best, which is a mindset I have carried throughout my time at university. Mr Carroll’s support through the UCAS application process was amazing and perhaps under appreciated by many at the time of our applications. Where are you looking to go following your graduation? I am going back to Cisco Systems in London as a graduate Business Analyst.